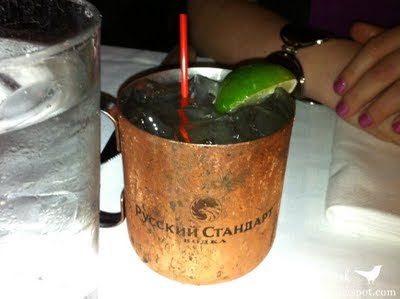 So, if you've been watching Oprah's Farewell Season, you will know that Oprah's favorite drink is a Moscow Mule. It goes without saying that I had to try one while I was in Chicago! A Moscow Mule is a cocktail made with vodka, ginger beer, and lime, served in a copper mug. It was popular during the vodka craze in the 1950s and it's name refers to the perception of vodka as a Russian product. - In a copper mug, pour vodka over ice. - Add sugar syrup and lime juice. - Top with ginger beer and stir. - Garnish with mint sprig and lime slice. I tried it, I loved it... and now I have to find out where to buy ginger beer on the prairies. That drink sounds fantastic. I have to try it too! Good luck finding ginger beer. I am lucky. I doubt I will have trouble finding it inth Raleigh NC area. Saw your Oprah episode today. Didn't watch close enough to see if you got on camera... What an inspiring show! Wow! So glad I watched-I'm inspired, excited and motivated. I can't even imagine what it was like to be there in person!!!! !